At the Ski Renter, our technicians provide you with the right equipment for your comfort and performance level. Check out our 2014 demo ski fleet. Rent Online and Save 20% off your reservation. 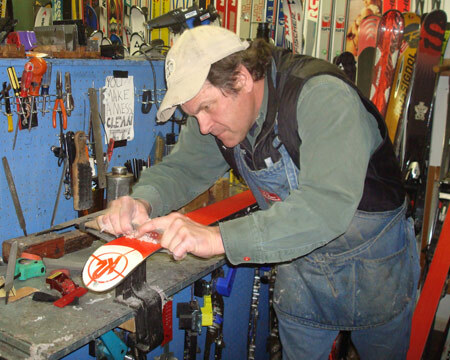 We’re a full-service ski and snowboard tune shop with 40 years of experience. In many cases, we can make your tunes overnight and have you ready to go the next morning! A two-step tuning process that includes precision machine sharpened edges and an all temperature machine hot wax. No base grind or base repair work is included. A hand hot iron wax is available for an additional $5. The Performance Tune includes the latest in base structure repairs and includes a machine finished edge as well as a machine wax corresponding to current snow & weather conditions. This tune does not include any base repairs. Hand iron hot wax additional $5. In addition to the benefits of the Performance Tune package, all minor base repairs are included. Base welds/core shots will be charged an additional $5 – $20 depending on the extent of the damage. 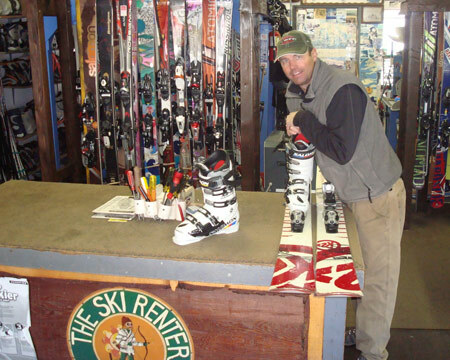 The Ski Renter is a full-service ski and snowboard repair shop with 40 years of experience. In many cases, we can make your repairs overnight and have you ready to go again the next morning!